The Ship's Cook (aka @the_cookworm) is currently on a pie mission - to find the top rated pie recipes from our nations supermarket suggestions. 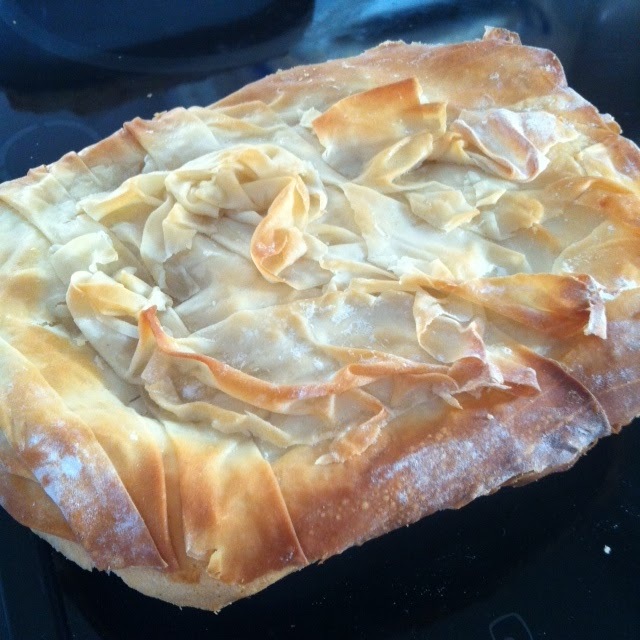 It started with a tweet we were sent by @jimbolimbo9 suggesting we try two pork pastry recipes from the supermarket Morrisons and from this The Ship's Cook decided to select one reci-pie from each supermarket's website or magazine to make and rate. 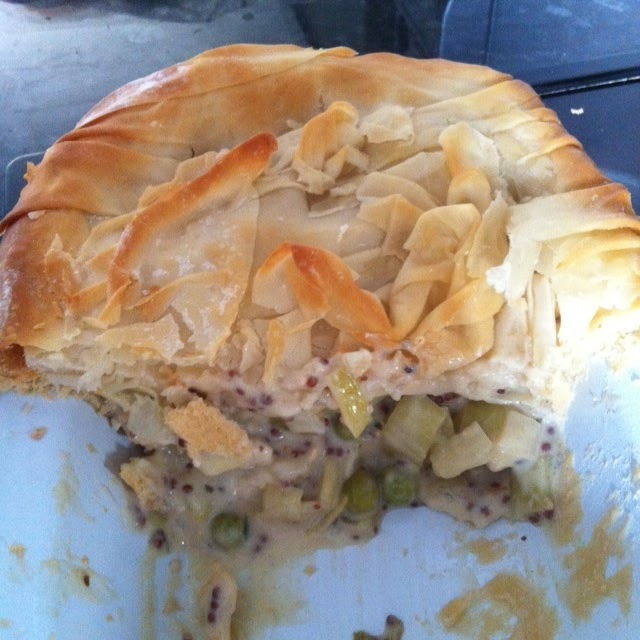 Today is the turn of Sainsbury's Chicken and Leek pie! If there's one thing that searching for recipes has taught me, it's that supermarkets have some funny ideas about what constitutes a pie. There are a lot of tarts and a LOT of stews with pastry lids out there, and don't even get me started on the time Tesco put up a poster with a picture of some sausage rolls and called them pies! In the absence of real pie options, but wanting to continue in my supermarket pie quest, I have adopted a new motto: If in doubt, add a crust. Which is exactly what I've done in my next reci-pie review. 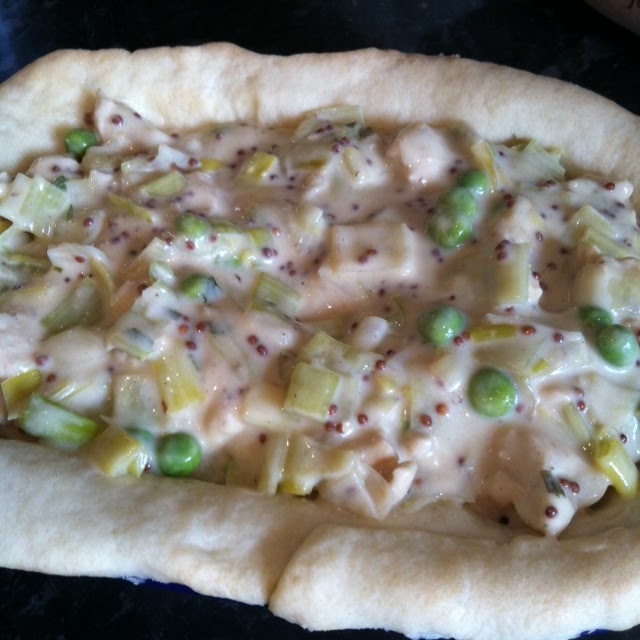 The original recipe suggests you serve this pie in individual dishes - this works well, but I used slightly bigger ones than suggested so I could add a shortcrust pastry base and ensure the filling was fully encased. 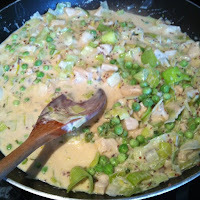 This had a nice thick sauce thanks to the addition of flour, and the cheese and milk mixture made it really creamy. Once I'd filled up the pies there was some sauce left in the pan to use like gravy, which I liked. Look at that great creamy filling! Sigh. 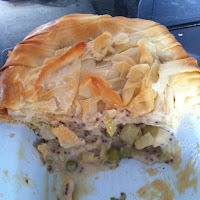 A big fail here, as the original recipe was called a pie but was really a stew with a top crust. Once you add a bottom crust to turn it into a real pie, there's a lot of filling so you can get a really good crust:filling ratio. Great capacity...as long as you add your own base. The chicken was lovely and tender, the leeks were soft but flavoursome and the peas added a bit of bite - lots of points scored here. The addition of filo pastry makes this a bit more expensive than your average pie, but the rest of the ingredients aren't too bad - a lot of them are things you might buy anyway, like garlic, mustard, and peas. The recipe does feed a lot of people - it says six and I think that's about right. I really enjoyed the flavours of this pie. I thought the mustard might be a bit overwhelming, but it wasn't at all - you could still taste the chicken, leeks, and peas and the creamy sauce was lovely with the crispy filo pastry. Yum. Two words - soggy bottom. These pies looked absolutely delicious when they came out of the oven, with brown crispy tops and a tempting smell, but the shortcrust base was a bit soggy despite me blind baking it before adding the filling. I can see why this was originally a stew with a lid - but you could probably make the sauce a bit thicker and put the filling in the fridge before filling the pies to try and avoid this problem. Tesco have done a proper job with this top pie! Has ASDA served up an absolute classic? #GrillAPierateer: Your 10 pie questions answered!